Clay certainly has some interesting obsessions. For one, we can’t keep a bottle of hydrogen peroxide in the house. We’ve tried. We buy them. We put them behind locked doors. (Many doors in our house have locks, a topic for another time.) If we slip, though (leave a door unlocked, leave a bottle out for just a second), he will find it, and he will dump it in the sink. Sure, he likes to dump shampoo and liquid soap, too. But he attacks hydrogen peroxide like a hungry dog going after a dropped hot dog. Clay also obsessively turns on lights. 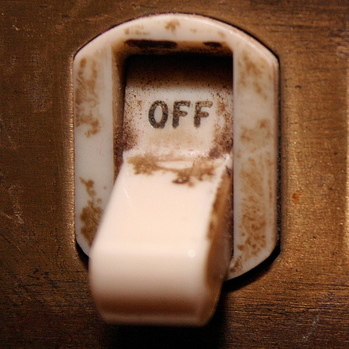 As the guy who pays the electric bill every month, I obsessively turn lights off. This leads to some interesting conflicts. Many nights I arrive home to find the house more lit up than my uncle Morris when he is making his famous three-whiskey eggnog. You can see the glow for miles. So, my first order of business is to go through the house turning off every lamp, every hallway light, every overhead fixture. every closet light. He turns them all on. Doesn’t miss one. The thing is before I’m even finished my rounds, Clay has followed close behind and they are all back on again. Yes, I’ve installed those switches that turn off automatically when there is no activity in the room, but those only work for lights controlled by switches. We have a particularly pitched battle over the upstairs bathroom. I turn the light off. Clay turns it on, often seconds later. I turn it off again. He turns it back on. The Hatfields and McCoys battle on. I think peace may come to the Middle East long before Clay and I come to terms on this. My wife watches all this with amusement, wondering out loud who is more compulsive. I don’t have time to answer. I see a lamp on in the family room. Photo credit: Orange Steeler. Attribution. This entry was posted on March 29, 2010, 3:19 pm and is filed under Silly Behaviors. You can follow any responses to this entry through RSS 2.0. You can leave a response, or trackback from your own site. Your son’s persistence is impressive. A sign of strong problem solving skills. At least that is what I keep telling myself. We fenced in our back yard a few years back because of Clay’s penchant for wandering and sometimes visiting the neighbors unexpectedly. The gate kept him in for a few months, but he eventually figured out how to open it. Then we twisted some wire around the locking mechanism, but he eventually figured out how to work around that. Currently, we have a bicycle lock wrapped around the gate and the gate post. So far, removing that has proven to be beyond his motor coordination abilities. But I’m quite certain he’ll figure it out someday, and I will consider that a triumph on his part. Then I’ll make another trip to Lowe’s in search of a new solution. you know “clap on” “clap off” or use a codeword for the clapper.